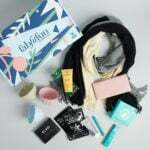 Oui Fresh Beauty Box is a brand new beauty subscription box from the ladies at A Beautiful Mess! Each month, we’ll be bringing you our favorite makeup, skincare, bath and body, and wellness brands in the form of one adorable box. The best part? The products in this box are made with only the good stuff, because that’s what you deserve. We’ve scored every product that goes into our box to ensure it meets our natural beauty standards. The Cost: $29.99 monthly, $24.99 with a 6-month subscription, or $19.99 with a 12-month subscription. Shipping is an additional $7 a box. The Products: 5-7 of Emma + Elsie’s non-toxic beauty favorites, delivered to you every month. Full-size products will be included in most boxes. Ships to: At this time, they can only offer to ship to certain countries outside of the United States, including but not limited to Canada and the United Kingdom. You’ll find an info card that doubles as a print and lists all of the items, plus where you can buy more of them. If you’ve read some of my other beauty reviews you may have picked up on my general disinterest in lip gloss. However, there is something about Oui Fresh that I am a fan of. They often send at least one of their products in each box, and many times it’s a gloss. This time they’ve sent “Jelly Shoes” ‘which is their clear gloss. It’s really light and slippery, not sticky at all which is the main thing I don’t like about glosses. The packaging is cute with its polka dot lid, and it smells sweet and sugary. The best part is that I don’t need a mirror or a steady hand to put this on. Since it’s clear, I can slather with reckless abandon and feel confident that my lips look kissable and shiny. Oui Fresh introduced me to this brand a few months back and I’ve since been obsessed with their face wash. Now, they’ve sent the precursor to cleansing- the face wipe! I always use a face wipe first to remove makeup and dirt, then go in with a cleanser and water to take care of the rest. I currently use a brand that isn’t as natural as Ursa Major so these make me a little tempted to switch even though I don’t love that they’re individually wrapped. They took care of any grime that was on my face at the end of the day and virtually no scent which is preferred. These will be good for travel since they can be tossed in a bag on their own instead of a bulky pack for 30, so I guess that’s an upside to the packaging. Not sure I’ll purchase these again, but I’m looking forward to trying the rest over time to make a decision. Oooh yay, another Ursa Major product! This one is their recovery cream aka a moisturizer that doubles as a night cream. Something about the color delights me. I think it’s because it reminds me of my beloved golden milk even though this doesn’t have the trendy turmeric ingredient. I looove the smell (is that you, sea buckthorn?) and just like they claim, it’s fast absorbing a nourishing. This just feels luxurious going onto my skin. I used it last night as an overnight treatment and was pleased with how it coated my face without feeling heavy and had my face feeling hella soft when I woke. I may have to splurge on getting a full size of this one! The last item this month is from a cute shop, Daily Disco. I’m not familiar, but they seem to have some fun accessories and also do custom jackets. The hairpin is a silver metal with big rhinestone letters spelling out O-U-I which is clearly perfect for this sub. The bobby pin is 2 inches long with the letters taking up about 1.5 inches of that and boy does it sparkle. I’ve never been a hair accessory gal, probably because my hair is so fine that nothing really stays put in it- including this pin. Ah well, I’m sure one of my girlfriends would love it! Verdict: I was pretty into this month’s Oui Fresh Beauty Box! I was most excited to try two more products from Ursa Major since I already like them and the shampoo and conditioner is working out well too! The gloss was a pleasant surprise but the hairpin wasn’t my thing. Overall I received 6 items for under $40.00 and discovered some new clean beauty that may become new staples! Can you still get this box if you sign up today? February is sold out but sign up here for the waitlist to grab a March spot and sign up for our email alerts for spoilers! Value Breakdown: This box costs $36.99 ($29.99 + $7.00 shipping) so you’re paying roughly $6.17 per item. Check out our past Oui Fresh Beauty Box reviews and the other boxes in Beauty Subscription Box Directory! What’s your favorite item from this month’s Oui Fresh Beauty Box? Hey Ashley! Golden Milk is a drink that includes turmeric + ginger, along with other ingredients (the recipe can differ). I’ve seen it popping up in cafés but I get a powder mix that I stir into milk at home. I find it super tasty and it has all sorts of health benefits. Turmeric seems to be showing up in all sorts of beauty products lately too! This box is highly overpriced or seriously under stocked. I was interested until I saw a clear lip gloss for $18.